The fence is complete. After tonight, the last night on which we expect a frost alert, we can put our garden starts outdoors into their permanent homes. We’ve been hauling them out every day (all seventy or so of them) and then hauling them all back in at night. They’ll join the orchard whips, to be protected from the deer by the new fence. If we had any doubts about whether the fence was needed, in the interim, a few deer stepped in to convince us we’re on the right path. We hope the trees will recover. The bees arrived today. The same fence protects them from the bears. 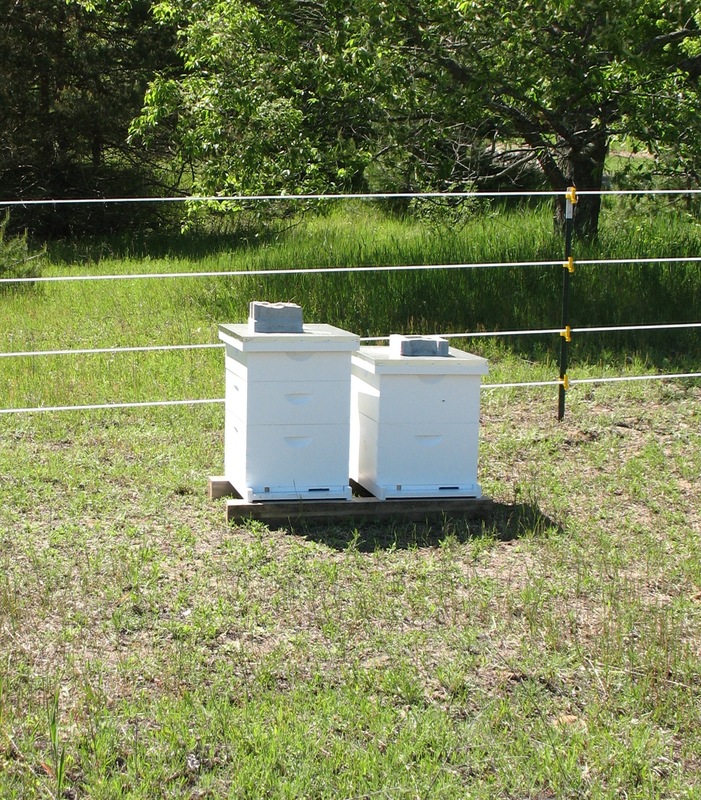 Today we simply placed their bee transport boxes next to their hives. They were too agitated from the trip to pull the frames and place them into the hive bodies—we’ll do it tomorrow. When we pulled the plug from the boxes, the bees from one of the hives poured out in an angry mob. I was afraid they’d swarm (and I’d fail on my first day of beekeeping!) Within an hour they’d settled down and already some of the bees had found the pin cherry trees, blooming right behind the hives. The autumn olives are in bloom, too; their near-tropical fragrance is the perfect bee balm. The bees wasted no time and got right to work. Tomorrow we’ll do the transfer to their permanent homes. The roof framing crew showed up, too! Soon we’ll have a roof and we can settle in to the summer’s rhythm of finishing the house, minding the garden and the bees. We’re all on the same trajectory here. Things are looking up. We started our little garden plants in tiny peat pots, some weeks ago. 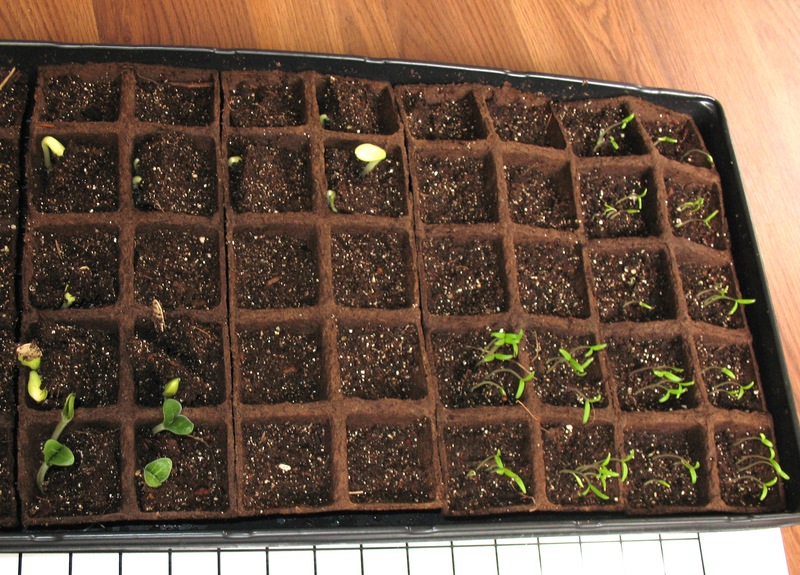 We’d carefully researched our frost-free date, and back-calculated the time for germination. I’m picky about such things because one of my pet peeves is vegetable starts that are root-bound at planting time. The date came, and went, and the weather forecast still warns of possible frost, so we cannot plant. But, our little sprouts are ready to roll. To harden them off, we’ve been carrying them outside on nice days and back in again every night. It’s like babysitting. Though I’ve never been an advocate of multiple transplanting (too lazy), this year I’m won over, if only to avoid the dreaded tangle of strangled roots in the bottom of the peat pots. Yes, I know that peat pots can supposedly be just dropped into the hole, but I’ve never done that, because even though the roots can grow through them, I’ve still experienced them causing a strangling ganglia of roots. And yes, I know there’s a whole school of thought that advocates multiple transplants for tomatoes—almost as gardening gospel. I don’t buy it. Like I said, I’m picky. We’re going away for a short trip. Added to my root-bound anxieties is the knowledge that the tiny peat pots would dry out before our return. They desperately need larger pots that can hold enough moisture to cover our four-day absence. 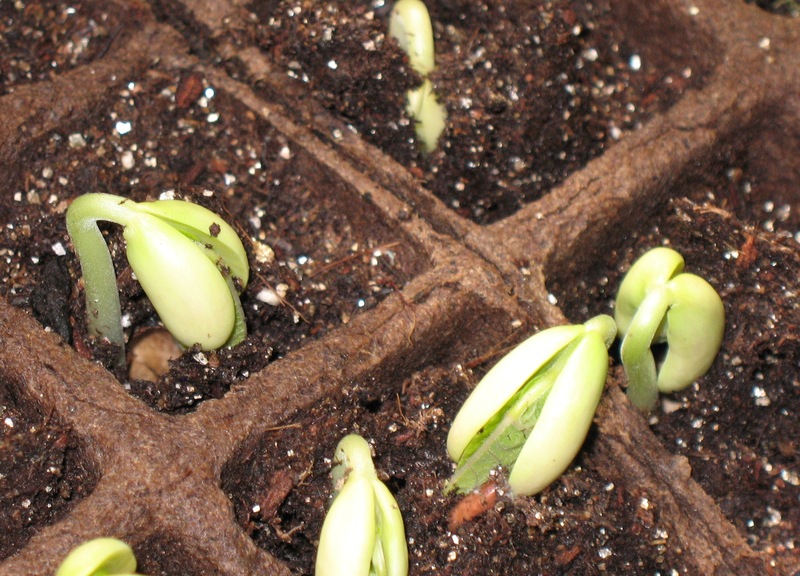 Transplanting is not an option; it’s a necessity. Since I wasn’t planning on it, I don’t have pots, one or two sizes up, in which to put these little sprigs. I had planned on going from peat pots, direct to the buckets dug into the garden. We’re not talking about a handful of vegie starts here; there are a lot of them. After exhausting all of our yogurt and salsa containers, each washed and punctured with drainage holes, I started scrounging through the recycling bin for additional pots. I scavenged some milk cartons, a cocoa tin, and the plastic trays in which my co-op sells mushrooms. Still, we were short. What was I going to do with all those tomato starts? I ran out to our local hardware store. They understood. Though they didn’t have a solution. (Their vegetable starts are in the same frost-free-limbo.) We all thought that the cold weather was done. Optimists, I tell ya! They suggested a trip across the county to a nursery/hothouse operation. Alternatively, they shrugged, there’s always 18-ounce, plastic beer cups. Sigh. I’m not a disposable-cup-kind-of-gal. But, in the quest for environmentally sound solutions, one must weigh the impact of the nearby expedient, versus the drive-around-the-whole-damn-county looking for appropriately sized pots solution. The local grocery had a small stack of beer cups for $3.19. So, I went for it. 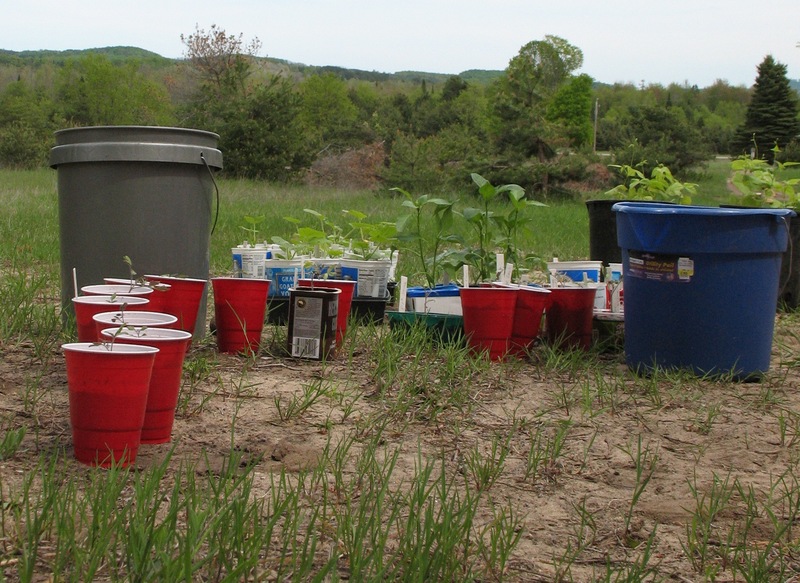 The plants will not spend long in their beer cups. I’ll save them for plantings in the future (along with all the punctured yogurt and salsa containers.) Next week, I’m sure they’ll all be ready for the final jump into the garden. I’m watching the weather site like a hawk. Next year, I’m gearing up for floating row covers. It’s either that, or it’s back to the beer cups. It’s nearly time to put in the garden, and that means that we need to make fence decisions. Our biggest garden problem is deer. The deer are also a threat to the orchard saplings. We’ve combined the garden location with the orchard to consolidate fencing needs. We’ll also have the bees in the corner of the garden, which complicates things a bit. Locally there is a split on the type of fencing or garden protection needed from the deer. (Oh yeah, and from the bunnies, too.) No matter what you do, it’s expensive. The uber-tall solution looks fortress-like and it’s permanent. I’d like a little more flexibility to move the fence, in the future, when the garden expands. So, I stepped into the vast world of electric fencing. Too many decisions! What’s the power source? Is it close enough to the house for AC power? (Not really, we’d have to underground several hundred feet of wiring for that.) That leaves us with the choice of solar, or DC. Solar sounds so….progressive and green. I was predisposed to that direction. Unfortunately, my research into reliability and power needs revealed that the system that would meet my needs (and have the warranty life I’d want) would be prohibitively expensive. That leaves us with 12 volt, DC batteries. The pebble in the shoe of all these plans has been the bees. You see, bees attract bears. (The hives down the road were raided by a bear, last summer—it isn’t a hypothetical problem.) An electric fence system strong enough to get a bear’s attention has to be pretty beefy. Fence controllers are rated in several ways, by distance, by ‘joules’, and by the type of hazard (animal) contemplated. Though a “5 mile” fence would be fine for deer, to get the kick you need for bear, a 25 mile fence is needed (even though the fence dimensions themselves don’t change—it’s not the length of the fence that counts, it’s the total length of the wire strands you use.) 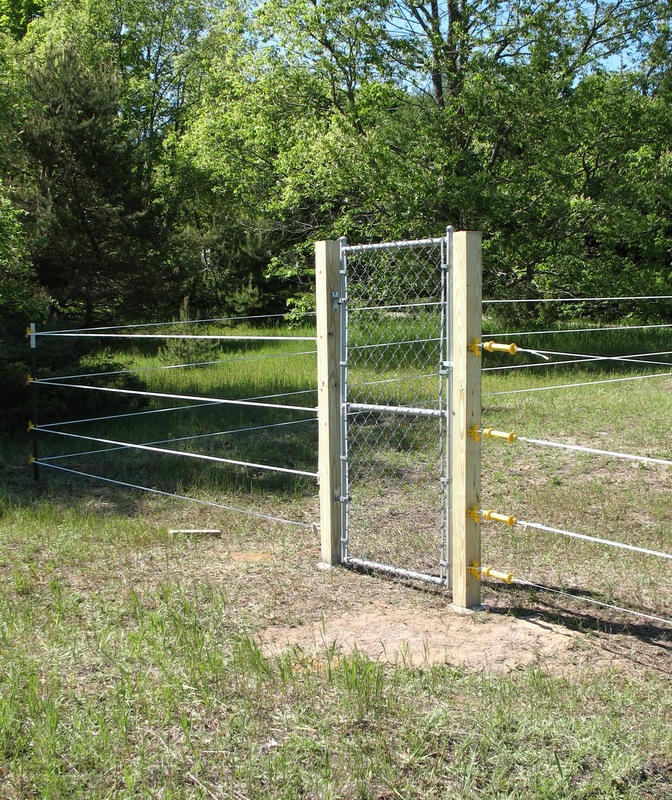 A bear fence calls for a minimum of four strands. Some contend that seven is required. Not that appearance is the arbiter, but a seven-strand fence looks like a maximum security prison—minus the razor wire. (One beekeeper actually suggested a double fence—with a 30 inch no man’s land between them!) I think we’ll go with four strands. 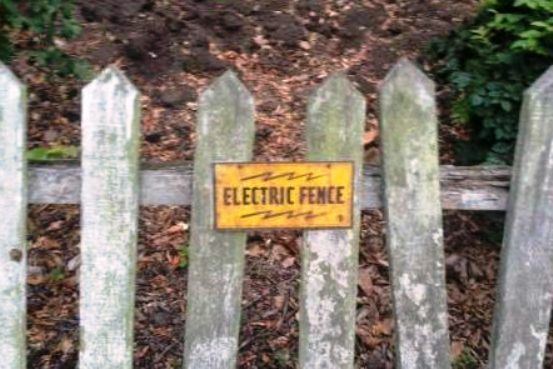 The fence must deliver a minimum of a one joule charge to dissuade a bear. That same power will make our fence pretty unfriendly to incidental human contact. It’s not a ‘leaning on the fence talking to neighbors’ kind of a fence. We worry about the cats. All of this has been Greek to me. I’ve been researching the fencing on the internet. It’s quite an education. For every fencing option, there are at least three alternate opinions. Unfortunately, our tailored needs will make it near to impossible to pick anything up second-hand. I have about a week to make up my mind. 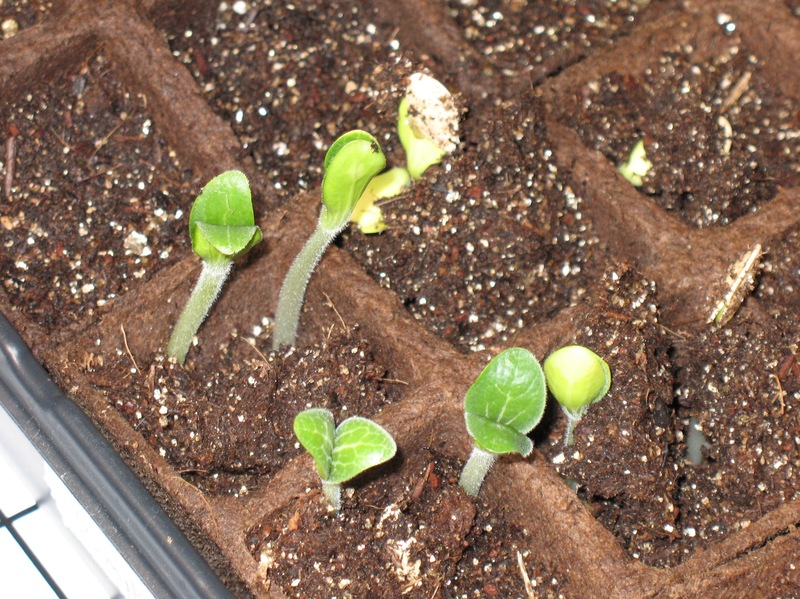 By then, our seedlings will be busting out of their pots, begging for a permanent home in the garden. And right after that, about the first week in June, the bees will arrive. We’ll need to be ready by then. 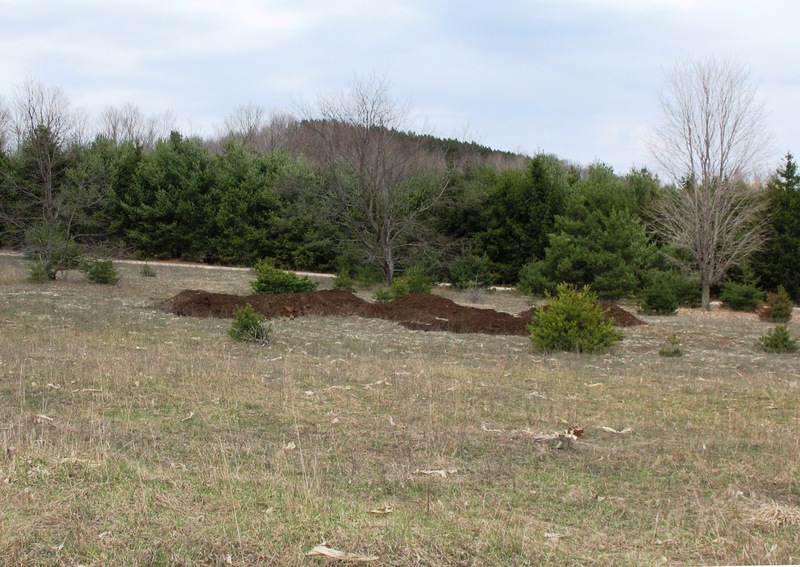 Not so much compost, after all. I drove into town the other day and was amazed that, almost overnight, lawns have turned green. There are swollen buds and tiny baby leaves on the lilacs and flowering quince. The tips of the maples are giving it away, too. In early spring, before they actually leaf out, their buds have a rosy glow to them. Across the valley, the areas with maples are blushing. The cherry orchards are blushing, too. Not blooming, but with a sort of out-of-focus burgundy haze. So, the landscape says spring. The weather report? That’s another thing, entirely. Day-time temps in the low forties, and snow! I kid you not. They’re calling for snow, up to 2 inches cumulatively, over the next two days. It won’t stick; the ground has already warmed up. The Road Commission has lifted the frost restrictions from secondary roads. But we’ve seen snowflakes this morning already. It makes us wonder if we have our timing right. Last week we had 45 yards of compost delivered. It sounds like a lot, but it isn’t. It looks like we have a really bad case of gophers. We’ll be digging it in deep to prep for the orchard trees (which should arrive next week.) The rest will be for the garden. We are on the threshold of gardening, but for that snow thing. But growing by the day. We’re still perched in a tiny apartment, across from our new digs. There are space and light issues here, mostly because we’re now sharing space with building materials and with hundreds of seedlings in peat pots. 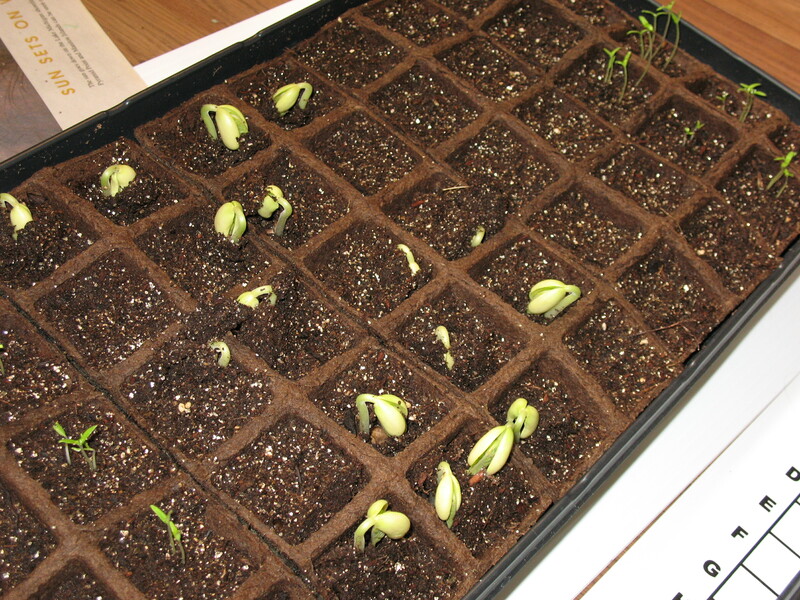 We used our seed favorites from Two Rock and have been pleased with a more than generous germination rate. (Oh, no! I’ll have to cull!) The only things that haven’t come poking up through the soil yet are the peppers (and, some questionable crook-neck squash seeds.) Peppers are notoriously picky about seedling temperatures–they like it warmer than we keep the house! I hope they’ll pop up soon. Everything else is up and growing. I certainly hope we didn’t start them too early. Like comedy, in gardening, timing is everything. Hopefully the joke’s not on us. It’s snowing out there, right now. There’s a little anxiety, and a lot of hope, in the mix.